Renee thinks of herself as the working persons psychic medium, I am just like you a wife, mother, friend, sister, the only difference is I can see to the other side. I am here to connect you...to show you there is more to life than what you see..
Renee Richards is a Clairvoyant Medium whose incredible gifts were discovered at a very young age. 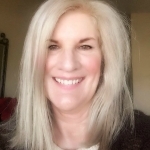 During a reading, Renee connects with your energy and higher self to deliver a reading that will touch you spiritually in many ways. She connects with crossed over loved ones for messages of love and healing- often there is evidence and validation in her readings. Certified medium (C.E.T certified (calibrated energy therapy) degree in liberal arts), and a chartered member of the World Metaphysical Association. Renee's history in Nursing, hospice and geriatrics was instrumental in honing her gifts . Renee’s mentoring program teaches many young mediums ethics, with a focus on evidential messages of healing. Renee is the owner and producer of “Teaching Tuesday”, a free platform featuring speakers, authors and guests. Associate consultant Eidolon paranormal “Haunting Australia” Allen Tiller Certified medium with Doreen Virtue. C.E.T certified (calibrated energy therapy) degree in liberal arts, chartered member of world metaphysical association. Energy healing paintings are also something Renee is very proud of as while she was painting she heard a voice say to her “put the brush down and use your hands” she did and what came through was a new and exceptional way to become centered with in your own higher light, Renee was channeling the soul levels of others. These paintings are used by many to connect into their own higher light. I also offer mentoring for those that are searching for those who want to learn more on a deeper level. I offer this on website. Renee is super accurate!! Amazing! She gave me date, names, and was very specific. She is very pleasant to interact with and gave me quick responses. Will be doing more readings with her in the future, and will be referring her to family and friends!! Amazingly gifted. I did an email reading and I was, of course, skeptical. I was totally amazed when I got my reading. She knew the names exactly of my daughter and her daddy. The things said were things I could understand. I knew they were talking to her and sending me messages. I highly recommend her. Had a wonderful reading with Renee. She's really great, amazing, really gifted. She used names and details that only I would know. Recommend her very highly. God Bless You Renee. Keep on doing that. I have searched my whole life for someone like Renee! Over 60 readings & a lot of money wasted I have finally found an exceptional and very FINE Reader! I would suggest her to anyone looking to connect with the other side AND to connect with life's daily issues. THANK YOU RENEE!! I absolutely love you! I called Renee after listening to her show for a few months on Tuesdays and Friday's. I simply asked her if she felt anyone from the otherside around me. She felt my Grandmother watching over us and knew a lot about what was going on in my home. She really is a wonderful person and very gifted! I hope to call her again. Renee Gave me a reading on BTR, to say I was shocked is an understatement. I have never had a reading where they can give you all the names, she even named my husbands name. The loved ones on the other side my parents who are together on the other side even though they divorced, that was so suprising and amazing. Renee is the real deal, in fact the only real medium I have ever spoke wth. Thank you Renee, after speaking with her I didnt feel so alone anymore, it was so wonderful. Renee's Mediumship abilities are INCREDIBLE. She is a validating Medium. What an incredible gift she has. Thank you so much! Well I had heard about Renee and her mediumship abilities, and then I had a reading, and they are right what they are saying. I was very touched, and I learned a thing or two about death, and going to the other side. I believe. Words cannot express what I experience on my reading with Renee Richards. With my session I learned so much about myself in a comforting way. Renee was extremely accurate throughout the reading. Before waiting for her call I was extremely nervous and after the first minute talking to her I was really comfortable. I have had readings from Renee for about a year, and she see's very clearly, and can give great light into where ever you are traveling on this earth. Connected me to my husband who has passed and my mother, kind and sensitive, and evidential medium. Renee is absolutely AMAZING!!! She was incredibly accurate with details and names! She truly has a wonderful gift!! Renee has very strong abilities and is very kind and gifted! She is the most accurate psychic/medium I have ever spoke with!! She also has very affordable prices and is very generous with her readings and time!! She was able to be spot on in my readings even giving me names of deceased and living loved ones. Many of the things she was able to tell me about myself I had not told a soul. I could go on and on trust me but then this post would be to long so I will end with Renee is AMAZING!!! Renee is really good at what she does. She has a lot of patience and understanding. She was very accurate with her visions. Renee helped me better understand myself but those around me. Thank you so much. Renee is so kind and gifted in her abilities. I was amazed at the level of detail she would describe aspects of my family and by late father. She is kind in the delivery of her message and it is soo comforting to know that my dad is so full of joy on the other side. I very much recommend Renee for pressing issues or simple words of encouragement. Thank you for sharing your gift with people! I got a reading from Renee on Blog Talk Radio and was blown away at how accurate she is...not long after that reading, she personally was asked by my husband in spirit to give me a private reading, no charge, and she called me at my home and gave me an amazing, exciting reading that made me feel I was having a visit from my husband, and the best part is that it was on my birthday! Renee is kind and compassionate and has a wonderful sense of humor...she is so gifted, I cherish and appreciate her!